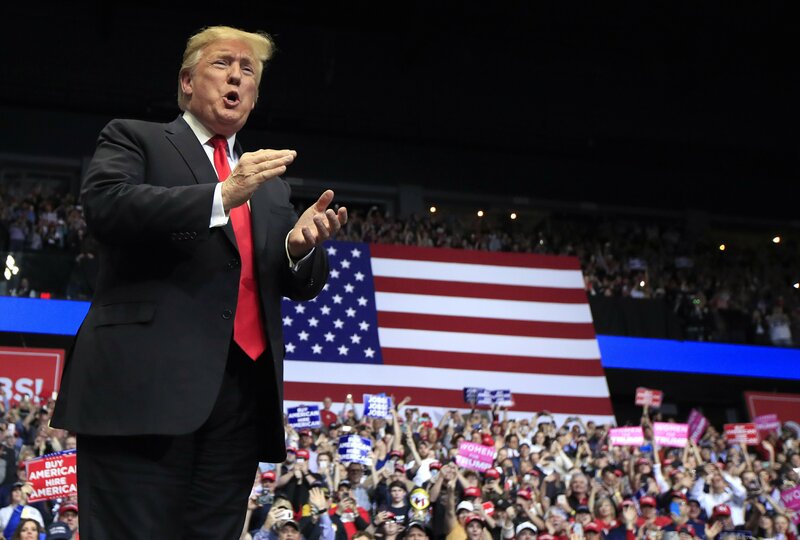 WASHINGTON — President Donald Trump is greatly exaggerating what’s happening in the auto industry and health care and repeating false claims about special counsel Robert Mueller’s conclusions in the Russia investigation. TRUMP, on electoral votes: “We won 306 to 223.” — rally. THE FACTS: No. He won 304 to Hillary Clinton’s 227, according to an Associated Press tally of the electoral votes in every state. He routinely misstates the result. TRUMP: “We did really well with women.” — rally. THE FACTS: Not that well. He actually lost the women’s vote. About 54 percent nationally voted for Democrat Hillary Clinton, according to exit polls, compared with Trump’s 41 percent. He won 52 percent of white women, according to those polls. TRUMP: “After three years of lies and smears and slander, the Russia hoax is finally dead. The collusion delusion is over. The special counsel completed its report and found no collusion and no obstruction. …Total exoneration, complete vindication.” — rally. THE FACTS: Mueller did not vindicate Trump in “total” in the Russia probe. The four-page summary by Barr released Sunday notes Mueller did not “draw a conclusion — one way or the other — as to whether the examined conduct constituted obstruction,” but rather set out evidence for both sides, leaving the question unanswered of whether Trump obstructed justice. Barr wrote in the summary that ultimately he decided as attorney general that the evidence developed by Mueller was “not sufficient” to establish, for the purposes of prosecution, that Trump committed obstruction. TRUMP: “The Republican Party will become the party of great health care. … Republicans want you to have an affordable plan that’s just right for you.” — rally. TRUMP: “If the Supreme Court rules that Obamacare is out, we will have a plan that’s far better than Obamacare.” — remarks Wednesday to reporters. THE FACTS: Republicans may aspire to great health care but they don’t have a comprehensive plan for it. And there’s no indication that the White House, executive branch agencies like Health and Human Services, and Republicans in Congress are working on one. TRUMP: “We will always protect patients with pre-existing conditions, always.” — rally. THE FACTS: He’s not protecting health coverage for patients with pre-existing medical conditions. In fact, the Trump administration is pressing in court for full repeal of the Affordable Care Act — including provisions that protect people with pre-existing conditions from health insurance discrimination. TRUMP: “We’re bringing a lot of those car companies back. They’re pouring back in.” —rally. TRUMP: “We’re opening up car plants in Michigan again for the first time in decades. They’re coming in, really pouring in. … And this has been happening pretty much since I’ve been president. It’s really amazing what’s going on … We’ve brought back so much industry, so many car companies to Michigan, so we’re very happy.” — remarks while departing for Michigan. The diversity visa lottery program is run by the U.S. government, not foreign governments. Other countries do not get to sort through their populations looking for bad apples to put in for export to the U.S. Citizens of qualifying countries are the ones who decide to bid for visas under the program. Trump routinely blames foreign states. TRUMP: “They’ve been trying to get VA Choice for over 40 years. Couldn’t do it. I got it. We signed it six months ago.” — rally. THE FACTS: Not true. He’s not the first president in 40 years to get Congress to pass a private-sector health program for veterans; he expanded it. Congress first approved the program in 2014 during the Obama administration. The program currently allows veterans to see doctors outside the VA system if they must wait more than 30 days for an appointment or drive more than 40 miles (65 kilometers) to a VA facility.